Kelly Oakes (of Basic Space) interviewed Nobel Laureate Brian Schmidt, one of the astronomers who discovered dark energy in 1998. His story is a fascinating one, again highlighting how the observational evidence forced him to accept cosmic acceleration. However, the interview also brings up an important point: dark energy solved some of the outstanding problems in cosmology, including the huge amount of missing energy required to make other observations consistent. Astronomy writer Desiree Abbott (AKA Ms. 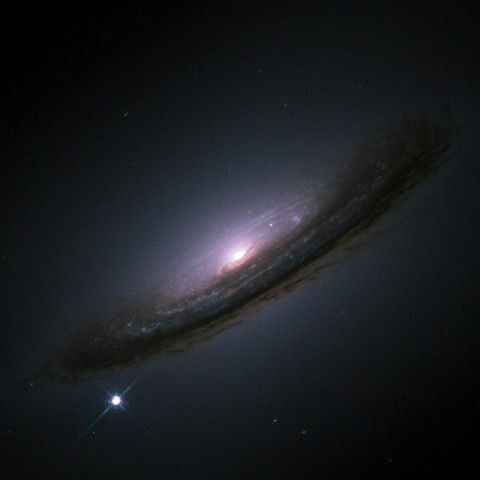 Disarray) explains why white dwarf supernovas are an excellent way to measure the rate of cosmic expansion, including acceleration. Her post is an excellent introduction to the concept of “standard candles”, astronomical objects whose intrinsic brightness is either known or can be determined in a straightforward way. Katie Mack (the only one of this crowd to be featured in PhD Comics, as far as I know) delves into what we know about dark energy and how it constrains some of our kookier theoretical ideas. Specifically, she provides some reassurance against one of the scarier scenarios (known as the “Big Rip”) that’s been promoted around the internet recently. On a similar note, Ethan Siegel’s main contribution to the carnival answers many of his readers’ questions about dark energy: what it could be, and why some of the language used to describe it sometimes works against our understanding. My own contribution (’cause I’m long-winded) covers a lot of the same ground as the other writers: what we know and don’t know about dark energy, but also some ideas about how to distinguish between the various explanations. Thanks to everyone who participated in the Carnival! I hope you all enjoyed reading the contributions as much as I did, and let’s keep this going.